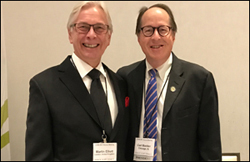 The 45th Annual Meeting of the Congenital Heart Surgeons’ Society took place in Chicago, Illinois on October 22 and 23, 2017. 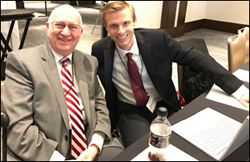 My sincere thanks to Dr. Harold Burkhart and the members of the Program Committee for organizing a fantastic meeting. We had a total of 159 registrants including 16 residents and 23 research coordinators. The program featured 7 basic science presentations, 7 videos, 9 posters, and 23 oral presentations. In addition we had a very successful new session entitled, “My Worst Nightmare Case.” Four courageous surgeons recounted incredibly difficult cases where despite their best efforts, the outcome was not ideal. By all accounts, this appeared to be the session at which all members learned some very useful lessons from their peers. One of the highlights of the meeting was the CHSS Data Center Report. This was presented by Drs. DeCampli, Kirklin, Williams, and Devlin (9th Kirklin-Ashburn Fellow). The Data Center was responsible this year for 6 publications and 12 presentations at national meetings. An exciting new cohort that is being developed is Ebstein anomaly. Please remember to enroll your patients who have atrioventricular septal defect, left ventricular outflow tract obstruction, and anomalous aortic origin of a coronary artery. Another highlight was the Keynote Lecture delivered by Martin Elliott from Great Ormond Street, “Public Reporting and Regionalization: What the U.S. Can Learn from the U.K.”. I am pleased to announce several initiatives that were approved at the Executive Council meeting on Sunday of our Annual Meeting. The CHSS has proposed and the World Society has agreed that the World Journal for Pediatric and Congenital Heart Surgery (WJPCHS) will become the official journal of both the CHSS and our sister organization, the European Congenital Heart Surgeons Association (ECHSA). Each society will have an Association Page to be used for announcements, notification of upcoming meetings, board composition, and messages to members. Both CHSS and ECHSA will have their logo on the front cover of the World Journal for Pediatric and Congenital Heart Surgery. Digital access to WJPCHS will be free for members of both societies. The WJPCHS will publish CHSS position papers, Presidential Addresses, and offer expedited review of CHSS presentations. This association with a major journal will enhance the international presence of our organization. Dr. Emile Bacha our Secretary-Treasurer gave the membership and financial reports. We currently have 148 active members and 86 institutional members. The financial status of the organization is strong and we anticipate a year-end surplus for the Society. Dr. Bacha announced at the Business Meeting that the Kirklin-Ashburn fund has now reached a corpus of ,000. This was one of my goals when I became President one year ago. This will allow the CHSS to use the annual interest to fund the Master’s degree in Public Health that is obtained by the Kirklin-Ashburn fellow. We are now one step closer to fully fund the salary of the fellow which until now has been graciously funded by the University of Toronto and the Hospital for Sick Children (Sick Kids). If you would like to help us move toward that next goal, fully funding the expense for the Kirklin-Ashburn Fellow, you can make a pledge, or a full donation, online through our CHSS website. The CHSS Historian will now be a voting member of the CHSS Executive Council. The number of Active CHSS Members is raised to 200. The award for the Best Resident paper this year went to Dr. William Ragalie from the Children’s Hospital of Wisconsin for his presentation entitled, “Donor Cell Free DNA as a Non-Invasive Indicator of Rejection following Pediatric Cardiac Transplantation.” In conjunction with our education mission, the Executive Committee approved a motion to invite all ACGME approved Congenital Cardiac Surgery Fellows to the meeting next year. The registration fee for these fellows will be waived; this should encourage more participation by this very important group. I am very excited and pleased to announce that after multiple discussions with the ECHSA that the Executive Council has voted to hold our 5th Joint Meeting with the ECHSA in Boston, Massachusetts. Many of our European colleagues (and CHSS members) trained in Boston. This will also allow easy access for the European surgeons to come to this lovely East Coast city. The exact date has not yet been set, but the meeting will be in the Fall of 2020. The Membership Committee reviewed a slate of candidates who were then proposed and approved by the Executive Council. Congratulations to the new members of the CHSS: Anastasios Polimenkos (University of Wisconsin), M. Sertaç Çiçek (Mayo Clinic), Osama Eltayeb (Ann & Robert H. Lurie Children’s Hospital of Chicago), Tara Karamlou (Phoenix Children’s Hospital), David Meyer (Long Island Jewish Medical Center), and Jess Thompson (University of Oklahoma). The Historian reported the Necrology for the past year. Dr. Gordon Danielson Jr., 85, of Rochester, MN, passed away on October 2, 2017. Gordon worked as a pediatric cardiovascular surgeon and educator from 1967-2002 at the Mayo Clinic in Rochester. Dr. Davis C. Drinkwater Jr., 70, of Nashville, TN, passed away on March 13, 2017. Dr. Drinkwater was Professor of Surgery and Chairman of the Department of Cardiac and Thoracic Surgery at Vanderbilt University in Nashville. Please make plans to attend the upcoming Data Center Work Weekend in Toronto on November 17 and 18 if you can. More information can be obtained on our website. The CHSS Executive Council will next meet in Ft. Lauderdale at the Society of Thoracic Surgeons Annual Meeting on Sunday, January 28, 2018 from 5-7 p.m. It was exciting for me to see so many old friends and to be a part of such a great scientific meeting which had free discussion of problems and new developments in congenital heart surgery, the true mission of our organization.